The Christian Cultural Center’s Cultural Arts Academy Charter School – a charter school of the arts- hosted a homecoming event at their Brooklyn location recently. What was so special about that event was an element that served to raise awareness of the importance of entrepreneurship for those who pursue the arts – especially for children at the primary school level. The event coordinator, Mrs. Joy Spruill, a Fine Arts graduate herself, who gained first hand experience on how difficult it is for creative people to successfully follow their bliss through entrepreneurship, was right on target with this vision. “Far too many African Americans lack the knowledge or financial soundness to even consider this as an option. It is my intention to surround our students with familiar faces that have accomplished the challenge of owning their own business. It is my hope that through exposure that entrepreneurship will no longer seem so foreign to our scholars.” Mrs. Spruill said of the motivation behind this event. Worthy of note and a great delight, is the fact that a kindergarten vendor participated as a seller of lemonade – which not surprisingly – sold out before long. “She exemplified one who demonstrated to her peers, that regardless of age, one can acquire an understanding and an interest at all different levels that can lead to a successful experience.” Mrs. Spruill added. It is fitting for me to end by saying it was indeed a pleasure to execute my duty as a “Good Villager” and join the church, school, home and community as a whole, to creatively empower our future leaders. The Cultural Arts Academy Charter School can count on me to collaborate with their creatively supportive spirit in the future. The warm embrace I received from Principal Midgette, Mrs. Spruill and her husband Ron Spruill, and others I encountered, will forever remain with me, and serve as a catalyst that adds to fueling the connection of the dots of my creativity! I believe that much encouragement should be given to community-generated initiatives aimed at encouraging self-sufficiency that can be realized by practitioners of the arts. This is a start to acquainting our children with the many elements that make for successful entrepreneurship. What innovative ways to embrace and steer young minds toward success have you entertained or implemented? Please share. This lovely display by the Joy Spruill team of an almost life-like photo and bio was as humbling as it was amazing! My husband, James Lacy, and I extend our gratitude to everyone who made this a special experience for us. It is Countdown time to yet another Mother’s Day experience for me! With all the hard work she put in to earn herself a final semester GPA of 4.0, my daughter deserves to be lauded publicly. It is with great anticipation and excitement that I look forward to commencement day! I want to apologize ahead of time to other proud parents and relatives for blocking their view, in the event that I experience difficulty staying seated when my daughter, Madona Ayorinde, walks across the Wellesley College Stage to receive her Diploma on Friday. 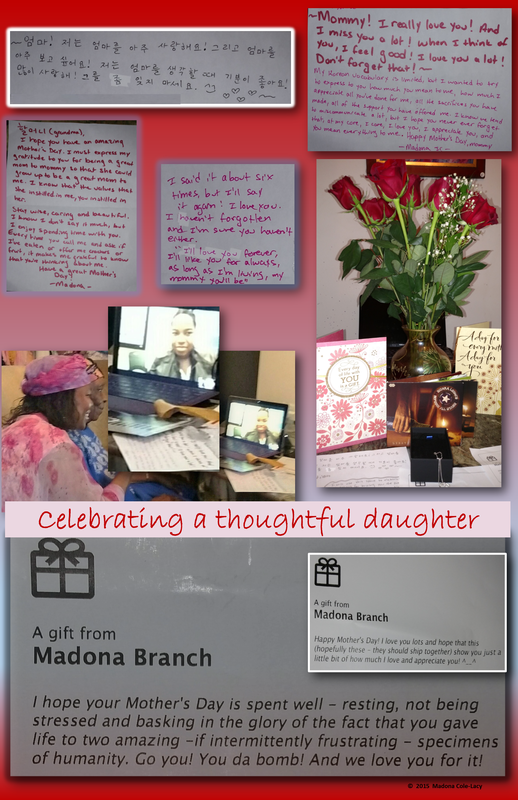 I find that celebrating my chil dren’s growth and accomplishments on a regular basis serves to strenghten our bond and keeps a much needed line of communication open as I play my Mommy Role as their unofficial whether-you-want-to-hear-it-or-not Consultant on the lessons of life. This is even more exciting and meaningful as a team effort, with full participation of my husband. In spite of her demanding schedule as she prepared for the ending of her final year, she was able to take the time to reach out to me and her grandmother in a very special way. I love you too, Madona.